When you say easy and convenient, Keurig is probably your first thought. And while there’s nothing wrong with buying a k-cup coffee maker of your dreams, if you’re looking to make the most of your morning routine and/or your budget, you might want to consider other options as well. Today I’m sharing my favorite 3 alternatives to Keurig coffee makers. This list is in no particular order, so look for the one that best fits your needs. The Ninja Hot and Cold Brewed System is a terrific buy. 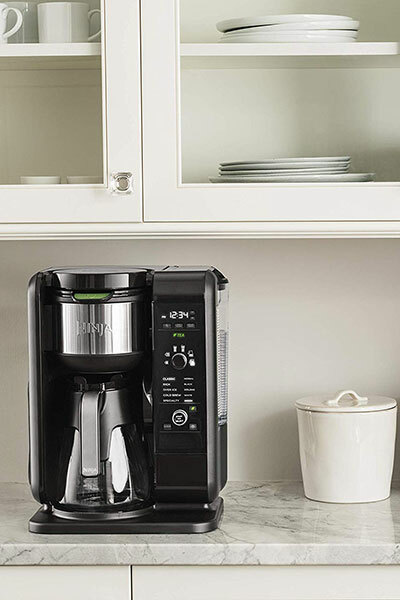 It’s packed with features: you can brew a single cup, travel mug, half or a full carafe, and there are settings for a classic brew, rich brew, over ice brew and a specialty brew. It’s easy to use and clean and has removable brew basket, which is always convenient rather than having to scrub it with paper towels. The Ninja uses ground coffee instead of pods, so it’s also good for the budget. Need regular coffee and espresso? Nespresso Vertuoline has you covered. With its single button operation, it’s even easier to use than Keurig. Besides a default cup sizes for coffee and espresso, you can also program desired drink volume. Combine Vertuoline machine with electric milk frother and you’ll be able to make all your favorite drinks – right in your own kitchen. While Nespresso pods are more expensive than regular k-cups and you need to order pods online, having a good setup at home will encourage you to use what you have at home and make coffee any time you want, for a fraction of what the coffee shops charge. Related: Check out my Nespresso Vertuoline review. Want to go completely plastic-free?! Choose a French press or pour over brewer. It might be old-school, but it works: bring water to a boil, cover grounds with water and let steep for a few minutes. Cleaning is a breeze too – just quickly wash with warm, soapy water, rinse and store. If you’re looking for a budget-friendly way to make a big impact (and a great cup of joe), the manual brewer is the answer. And, whether you place it on your counter or table, it will add some serious charm to your home. Learn more about popular plastic-free options.